Originally from Australia, parakeets are delightful and fun birds to have as pets. It is in their nature that they are incredibly cheerful and love to have fun and chirp throughout the day. One of the reasons they make such fantastic pets is that they are one of the most affordable types of exotic birds in which you can simply head to your local pet store and purchase to take home with you. How Long Do Parakeets Live in Captivity? Parakeets have lived long fruitful lives since the beginning from their origin of Australia. While they are now all over the world each parakeet can live in captivity for 7 to 14 years, even up to 20 years if proper care is taken. It is easy to get any parakeet towards their maximum lifespan. It is important to remember not to fall behind or slack as a pet owner. Through providing a healthy lifestyle for your parakeet to live in it is sure to live well past its expected medium lifespan. It is our duty as bird owners to provide our favorite feathered friends with the best possible care there is. Parakeets rely on us as people to provide for them care that they simply can't provide for themselves. Parakeets find their historical origin in Australia. It is there they originally flew together in groups called flocks. This would define who they were and where they would end up flying to. When you bring a parakeet into your home you, and your surroundings will become its habitat. 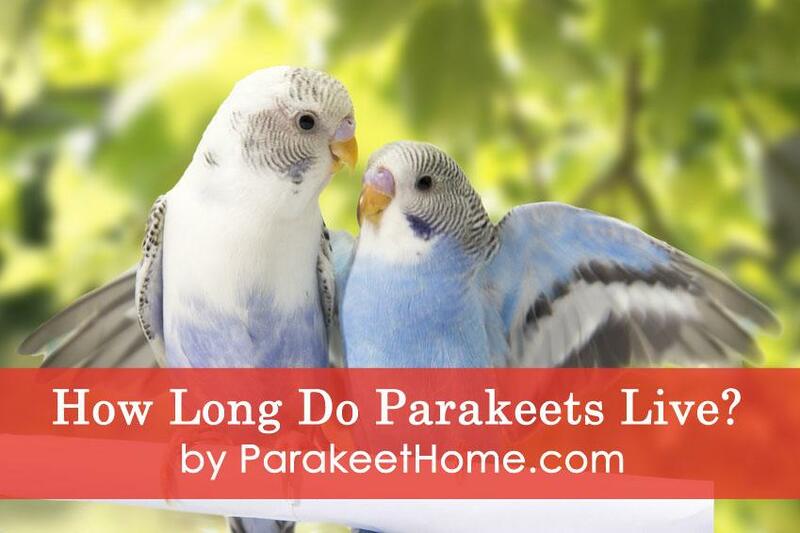 This allows the parakeet to feel safe and live a much healthier extended lifestyle. It is in Australia that the parakeet would be referred to as the budgerigar or budgie. If you ever run into anyone who you think is mislabeling your parakeet as a budgie, you do not need to worry as this is simply an alternate name stemming from its origin. While in Australia parakeets flew in flocks. Flocks allowed the parakeet to live efficiently. Now in homes, it is up to owners to provide the care required for parakeets to survive and prosper. Parakeets are now some of our favorite feathered pets. While we care for them, we mustn't forget their exotic roots. It is only through a better understanding of the parakeet that we can help to prolong its life. With a healthy diet, a parakeet can live between five and twenty years. Once you have your parakeet secured in your household it is time to feed your new feathered pet something. Parakeets need a very specific diet in order to live a long enduring lifespan. Some of the best sources of food you can provide for your parakeet are seeds, fruits, and vegetables. Seeds provide parakeets with basic nutrients that will keep them alive. Supplementing with some fresh fruits and vegetables in a very raw form will help your feathered friend to add years to its life. It will also help them be stronger and healthier. Vegetables and fruits provide vitamins and antioxidants. It is hard to find these found in the standard run of the mill foods. There are many different options available to select from. Options adequately feed your pet parakeet. Adopting a variety will keep your pet feeling healthy. Variety is truly the spice of life. This applies to parakeets when it comes diets they consume. Pet stores provide a multitude of options available on the market to choose from. We suggest talking to a professional to help choose the best brands of seed. You can also use food and vegetables from your own home. Just like any other animal, it is crucial to exercise and move about in order to maintain proper muscularity. Parakeets are born to fly around their natural habitat and confining them to their cage only shortens their lifespan. Allowing a parakeet to get out of their cage and fly at least once a day is a crucial way for a parakeet to get the adequate exercise it is so heavily dependent on for a good life. We recommend doing proper research as to what cage you provide for the parakeet to ensure that your parakeet is living in a safe environment. If a parakeet does indeed spend a significant amount of time inside of its cage, then adding new toys that it can climb and interact with is essential to provide the parakeet with the physical activity that it will need to stay well. A parakeet lifespan is heavily dependent on whether it is getting an efficient amount of cardio exercise to make sure that the bird's muscle does not suffer any form of dystrophy and that its heart remains healthy and strong. Interaction is not just good for your parakeet's body but also for its brain. Toys that allow a parakeet to have different options in terms of what it can interact with allow the bird to think more and remain mentally healthy. Just like any other animal, it is essential that birds do not get bored as this will have a major factor as to how long a parakeet or budgie lifespan will be. Toys that stimulate your parakeet ultimate will prolong its lifespan. Reviewing all the previous information, the best way to make sure a parakeet lives a lengthy and healthy life is to make sure the parakeet has access to healthy foods, a space in which to exercise, and toys that will keep a parakeet's mind constantly thinking and moving. Parakeets are some of the most affordable exotic birds available on the market. Exercise practices for your bird can ensure a splendid lifespan. We highly encourage all parakeet owners to get into the kitchen. Try to chop up some fruits and vegetables. Let your parakeet out more often to fly and discover your home. Give your parakeet the toys its little brain needs to continue thinking and learning. Parakeets are extremely loving pets. We are sure with proper care, yours will live a long life.